Aside from providing high quality fresh fruit and vegetables daily, we partner with some of the United States largest distribution chains. We allow our distributors to deliver timely, fresh, high quality produce right the doorstep of their customers. Nino’s Fresh Cut Fruit & Veg. has been working with distributors from day one, and pride ourselves in being honest, upfront, and a company that strives to be better. 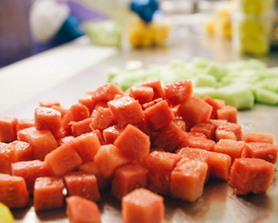 Your fruit is hand-selected at the peak of flavor. We don’t have national suppliers or cavernous warehouses. Your fruit passes straight from the farm to us to you – fast. This means your fruit is clean, incredibly fresh, and awesomely delicious! Nino’s Fresh Cut Fruit & Veg. prides itself on offering competitive rates while not undermining the level of quality you have come to expect.